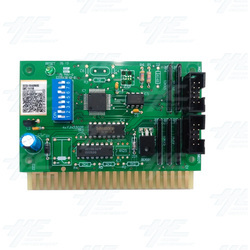 Arcade Credit Board Universal MK4e is a A credit board used with QL, NRI & C120 coin mechs. The Arcade Credit Board Universal MK4e has 8 dip switches for easy changing of pricing for credits. It also allows for 6 modes of operation. The Arcade Credit Board Universal MK4e is designed to handle coins from both the L and R coin connectors. Also the Arcade Credit Board Universal MK4e can issue bonus credits in both indirect or direct credit conversion modes and has the capacity to be linked to a coin meter &/or alarm. Free credits may be given out with the pressing of the "Service Credit Switch". This will not affect the coin meter. The service credit switch can also be used to enter Free Game Mode, which enables free play until being switched off. The Arcade Credit Board Universal MK4e is designed to handle coins from both the L and R coin connectors. Also the Arcade Credit Board Universal MK4e can issue bonus credits in both indirect or direct credit conversion modes and has the capacity to be linked to a coin meter &/or alarm. Free credits may be given out with the pressing of the "Service Credit Switch". This will not affect the coin meter. The service credit switch can also be used to enter Free Game Mode, which enables free play until being switched off.